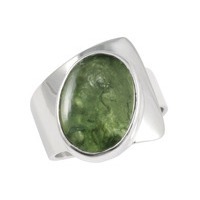 The mysterious, glassy green Moldavite has long fascinated the starry-eyed, with stories that it came from the heavens. The manner in which it came to be is, indeed, a very interesting story. 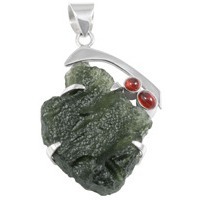 But it is its illustrious reputation as a stone of enlightenment and spiritual awakening that has earned moldavite so many admirers. Moldavite is a transparent, vitreous substance that occurs in various shades of green and exhibits a very distinctive surface patterning of creases, pockmarks, wrinkles and furrows. It was named after Moldauthein, a town in Bohemia (the Czech Republic), where it is found. Moldavite belongs to a group of glassy mineral forms known as tektites. The tektites were once considered to be a variant of obsidian, a natural glass formed through volcanic activity, but unlike obsidian, the tektites show no apparent crystal structure. This is because tektites cooled down from their molten state so quickly, that there was no time for crystals to form. In fact in structure, tektites more closely resemble artificially produced glass – what distinguishes them from glass is that the tektites contain very little water. Artificially produced glass contains between 10 to 100 times more water than tektites. Moldavite is commonly referred to as “the stone that fell to Earth,” though scientific evidence suggests that this description, though accurate, is also a little misleading. There are a number of theories about the origins of moldavite (and tektites in general), with some suggesting that it arrived from space in the form of meteors. Others suggest that they are not, in fact, extraterrestrial and that they were formed from earth-bound minerals, which melted and fused due to the impact of a meteor. Scientists generally lean towards the latter theory with strong evidence suggesting that moldavite was formed when a meteor, somewhere between 500m to 1 km in diameter, impacted with the earth some 14.7 million years ago in what is now Bavaria, Germany (The impact site is known as the Ries Crater, and is 22 km in diametre). The heat and force of the approaching meteor was so great, that it caused the local rock and sand to melt, even before impact. Upon actual impact, the molten earth-based rock and sand became airborne, just as water splashes when impacted with something of great mass, and reached heights of up to 25 km above the Earth (evidenced through an analysis by scientists, J Matsuda, K Matsubara and C Koeberl, of the concentration of noble gases trapped inside the bubbles in moldavite samples). The molten minerals remained airborne and traversed a distance of hundreds of kilometres, whilst maintaining high temperatures. As they fell back to Earth gravity reshaped the now quickly hardening moldavite into its characteristically common discs, rods, elongated ovals and drops. The distinctive furrows, pits and wrinkles on the surface of moldavite specimens are the result of long-term erosion, caused by water and naturally occurring acids percolating through the layers of sediment, in which moldavites are buried. The patterns of furrows vary according to the location of each moldavite deposit, and the trained eye can identify from which specific area a specimen comes. Specimens from the Besednice region, for example, are particularly deeply etched and almost feather-like. These are exceptionally beautiful and highly prized by mineral collectors. The regional differences in patterning is explained by the different compositions of the soil in which the moldavites have been embedded – different acidity levels and other variances in the sediment have caused the surfaces of the moldavites to erode in different ways. The impact of the meteor that fell in what is now Germany was so powerful, that the resulting moldavite deposits, referred to as “strewnfields”, are spread over a an area spanning four countries. They include the Czech provinces of Bohemia and Moravia, as well as parts of Austria and Germany. Finds have even been reported in Sweden. It is estimated that in total there were approximately 275 tonnes of moldavite spread across the splash area. It is said that within 10 years, the mines will be exhausted. Analysis of the chemical composition of moldavite finds no similarity to the composition of meteors, but in fact is consistent with the soil found in the Ries Crater region. This is further evidence to dispel the misnomer that moldavite itself is extraterrestrial. Moldavite is considered a mineraloid rather than a mineral. Mineraloids do not display any crystal structure and their chemical composition can vary significantly between specimens. 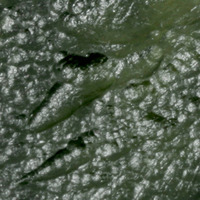 The main component of moldavite is silica (SiO2), which can vary to be between 70% to more than 80% of its composition. This explains why moldavite’s hardness varies so much between specimens. The other significant constituents are aluminium oxide (Al203) and ferrous oxide (FeO). There are also traces of ferric oxide (Fe2O3), potassium oxide (K2O), magnesium oxide (MgO), calcium oxide (CaO), sodium oxide (Na2O), Beryllium-10 and many other elements in minute quantities. 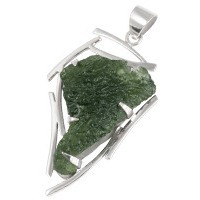 Moldavite generally occurs in varying shades of green, the most common being bottle green. However, lighter and darker olive shades also occur. It is the presence of ferrous oxide (Fe2+) that is responsible for its green colour. Higher concentrations of ferric oxide (Fe3+) will create a browner shade. 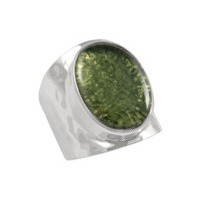 It is reported that glass manufactured in China is now being marketed as moldavite. It is being cast from moulds taken from natural stones. Buyers need to beware. The earliest evidence of human use of moldavite dates back about 25,000 years, in the form of amulets discovered in close proximity to the famous Venus of Willendorf. Since the Middle Ages moldavite was thought to be the grail stone (the holy grail itself has been described as a green stone that fell from the sky). From the 18th Century it was treated as a precious gemstone, being cut and set in jewellery and even walking sticks. It was a Czech tradition for men to offer moldavite to women when proposing. Indeed, it was considered a talisman for matrimonial harmony. 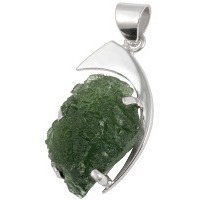 Moldavite is a product of transformation, born of the powerful confluence of Earth and the heavens. It is literally a fusion of the extraterrestrial with the Earth-bound. 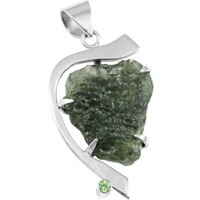 There is perhaps no other stone in this age that epitomizes personal transformation as much as moldavite. This is the quintessential stone of spiritual evolution. Simply holding it to the light and gazing into it is said to shift ones consciousness. It works its special magic by accelerating the natural process of ascension. It is said that moldavite conveys to us information stored in the Akashic Record and helps us to connect with the Ascended Masters. It is highly regarded for its ability to facilitate inter-dimensional connectedness with higher realms of consciousness and extraterrestrial civilizations. It appears that moldavite’s purpose is to catalyze the spiritual evolution of individuals, for the good of our planet as a whole. Moldavite often surprises the uninitiated because of the ease with which it can be physically felt. A sensation of heat or tingling in the hands and sometimes in the chest is often reported. Use moldavite as a tool for transcendence. It can help us to detach from the insecurities and fears of everyday life, such as those that revolve around career and money, and allows us to integrate our mundane lives with our higher purpose. Through helping us to be aware of our deepest memories, it allows us to pay attention to belief systems that no longer serve us and make the choice to no longer be bound by them. The powerful vibration of moldavite opens, clears and balances all the chakras, and inspires us to think outside the square. It empowers the heart to reach its full potential. Placed on the Third Eye, it helps transcend the concept of time, allowing us to see past and future potentials in the present. On the Crown chakra, it opens us to spiritual guidance. On the throat chakra, it facilitates communication with other dimensions. One may find when using moldavite that meditations are intensified, dreams are more vivid, and incidences of synchronicity are more frequent. Moldavite also provides some protection in the sense that it distances us from negative influence and attracts people and circumstances that are beneficial for our spiritual progress. There is also a grounding aspect to moldavite. It is said to help very sensitive individuals adjust physically and emotionally to the realities of life. A combination of moldavite and either smoky quartz or hematite is suggested for “star children”, who may feel particularly ungrounded and vulnerable in the world. Generally, moldavite is excellent when combined with other crystals, as it will enhance the energy of the accompanying crystal. Combined with seraphenite, it becomes a powerful healing tool. With Herkimer diamond, it intensifies visions. 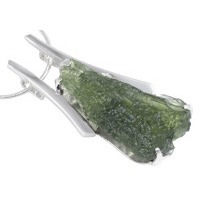 Faceting moldavite is said to magnify its energy, whilst combining with clear quartz will have a stabilizing effect. As a healing tool, moldavite allows us to see the underlying causes of disease, which gives us the opportunity to work through the issues and ultimately lead to healing. It is sometimes also used in diagnosis – people with an aversion to its green colour are said to suffer emotional blockages and trauma.